In the News | Helping Hands Healing Ministries, Inc.
An article about Dr. Sweeney’s NAFRA JPIC award and her work with Helping Hands Healing Ministries, Inc. was featured on the front page of the St Cloud In the News – Oct 2013. 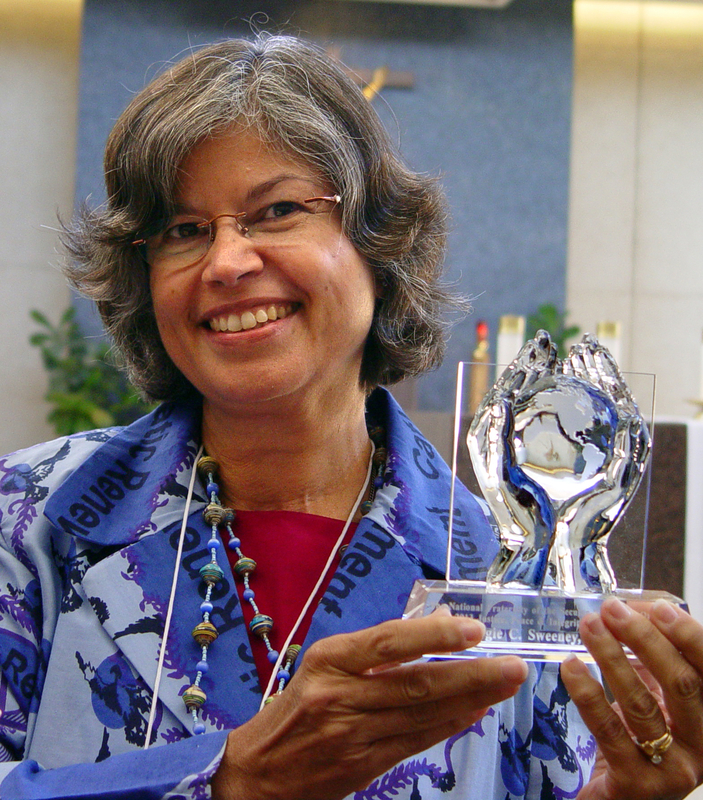 Dr. Sweeney was awarded the NAFRA Justice, Peace and Integrity of Creation award along with $2,000 for her work of poverty alleviation in developing countries through Helping Hands Healing Ministries, Inc., the nonprofit charity that she founded in 2002 for this purpose. To learn more about this award, please visit the press release. Margie C. Sweeney is a family physician, wife, mother, Secular Franciscan, and more. She wanted to become a doctor since the age of six and that dream was realized by the grace of God since she had a meager upbringing in poverty. As a teen she dreamed of helping the impoverished in distant lands but that dream was put on the back burner as she began her studies in college and then medical school. She also married and became a parent, pushing that dream further into the distance to the point that she had even forgotten about it. One day while at a retreat of her parish council her pastor spoke of his trips to East Africa. The words immediately jumped out of her mouth, “I’ll go with you!” Before long her schedule lined up and she was in East Africa, landing in Nairobi, Kenya on September 11, 2001! That was a life-changing trip. Despite her first-hand knowledge of poverty, she was deeply affected by this trip. She begged God to show to her how she was to follow His will through this experience. Over the ensuing months, she founded the nonprofit charity, Helping Hands Healing Ministries, Inc. (HHHM) to provide poverty alleviation in developing countries. Some examples of projects done through HHHM: assist a school in Zambia with electrical hook-up, start a dairy farm in Tanzania, provide tuition for various students in Africa, and more recently assisting on medical mission trips to Haiti. Her focus with HHHM is currently in Haiti as a medical missionary. Her first trip was in April, 2010 after the big earthquake in January. Just as her journey in Africa started on 9/11, her journey in Haiti was also marked by a big event. God certainly knows how to get her attention! I mentioned that she is a wife and mother. She has been married 29 years to Michael Sweeney who has been very supporting and nurturing to her. He is a civil engineer and has been going to Haiti with her for the last four years to assist with water and construction projects. They have a son Patrick who is 27 years old. He is a first lieutenant in the Army. Their daughter Kelly is 24 years old and currently works on a farm. Besides her hunger to do something constructive after her first trip to East Africa, she also developed a deep hunger to nurture her spiritual growth. She knew that God was asking more from her and she wanted to do His will. Through prayer she was lead to the Secular Franciscan Order. She became professed in 2006. She has participated in fraternity life of the Secular Franciscan Order in Indiana and more recently with the St. Michael the Archangel Fraternity in Tampa, FL. Participation has included assisting the Formation Minister (also serving as Interim Formation Minister during his illness), initial formation using the new FUN Manual, involvement with JPIC, and currently serving as the Vice Minister of our fraternity. You can learn more about the work of Helping Hands Healing Ministries, Inc. at https://www.facebook.com/helpinghandshealingministries. An article about the work of Dr. Sweeney and Helping Hands Healing Ministries, Inc. was published in the September issue of Louisville Medicine.